An exquisite Tolkowsky 1/2ct diamond bridal ring set, featuring an 18ct white gold diamond solitaire engagement ring with a halo of diamonds and diamond encrusted shoulders, along with a diamond set wedding band. As the inventors of the Ideal Cut, Tolkowsky adheres to the highest standards of quality with diamond centre stones that achieve the best combination of fire, brilliance and sparkle within the diamond. 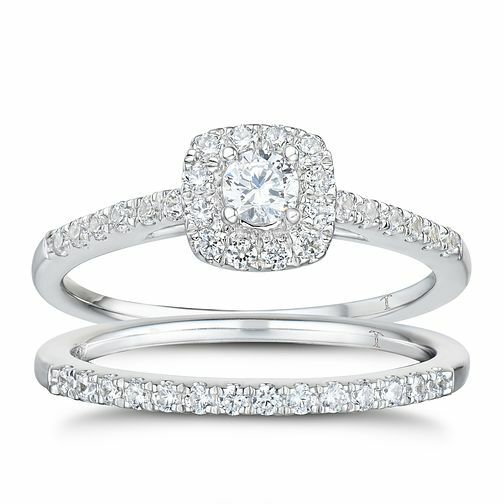 Tolkowsky 18ct White Gold 1/2ct I-I1 Diamond Bridal Set is rated 5.0 out of 5 by 12. Rated 5 out of 5 by Anonymous from Beautiful set for replacement rings I purchased this set as my husband accidentally threw my wedding and engagement rings away without realising. As my wedding ring was custom made with family diamonds I knew when I was picking a new set of rings to replace them I wanted something that wasn’t similar to remind me what I lost. This set is absolutely perfect. The setting is just perfect, the sparkle is amazing is all lights and I literally haven’t stopped staring at it since I got it. Staff in store were amazing and even helped me save some money on the set with a deal they had going. As much as my original rings can never really be replaced, these are beautiful and I’m so lucky to have it.